Just as research-based studies laid the path for clinical investigations with intravascular OCT and near-infrared reflectance spectroscopy, today’s pioneering research likely will result in a future in which multimodal nonlinear optical imaging will serve as a potent weapon with which to clinically investigate, understand and diagnose a variety of human health factors. Multimodal nonlinear optical (NLO) imaging is an emerging microscopy approach gaining widespread use in a variety of biomedical applications. It harnesses and integrates the unique capabilities of nonlinear processes such as multiphoton fluorescence, second- and third-harmonic generation (SHG and THG), and coherent Raman scattering (CRS) and combines them seamlessly into a single, unified microscopy platform. A combination of label-based and label-free imaging modalities enables simultaneous acquisition of complementary structural information within individual cells and elucidates the health of biological tissue at the submicron level. The emergence of multimodal NLO imaging has been facilitated by advances in ultrafast laser technology; high-performance specialized optical filters; and high-sensitivity detectors. The development of in vivo diagnostic tools and techniques that can be used to advance our understanding of the molecular, morphological and functional changes that occur during disease progression is critical for human health. Today, comprehensive interrogation of the structure and function of biological samples exploits advances in various optical microscopy techniques and modalities. Wide-field and laser-scanning confocal fluorescence microscopy have been used extensively to elucidate the form and function of biological entities at the submicron level. 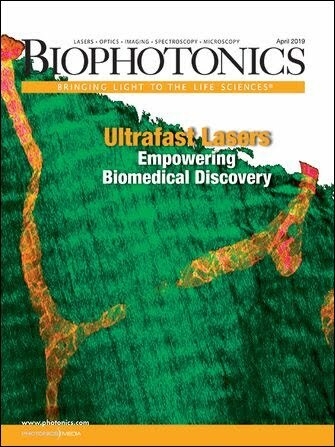 More recently, however, advances in ultrafast laser technologies have allowed the exploitation of several well-known nonlinear optical processes for use in biomedical imaging applications. Two common, well-known nonlinear imaging techniques are multiphoton fluorescence1 and coherent Raman scattering2 microscopy. The former typically uses femtosecond near-infrared laser pulses, while the latter, based on either coherent anti-Stokes Raman scattering (CARS) or stimulated Raman scattering (SRS), uses two separate picosecond near-infrared lasers to generate a CRS signal. As a result, it is not natural or obvious to combine these two imaging techniques into a single system. Advances in ultrafast laser technology; specialized optical filters for transmitting, reflecting and blocking various light signals; and high-sensitivity detectors now permit the construction of a single multimodal nonlinear optical microscope platform that offers both label-based and label-free imaging strategies with which to interrogate biological samples. Multimodal NLO microscopy combines several imaging modalities into a single unified platform and affords a myriad of benefits. Chief among these are: inherent 3-D sectioning capability; the ability to image deeper into samples, such as tissue, using NIR (700- to 1100-nm) light compared with linear microscopy, where visible (400- to 700-nm) light is used; the use of lower laser average power to prevent photodamage and phototoxicity compared with laser-scanning confocal microscopy; and the ability to exploit and combine label and label-free imaging modalities. In Figure 1, the utility of multimodal NLO imaging shows representative composite images of a section of kidney tissue from a mouse model. The image contrast is provided by collecting the (a) anti-Stokes Raman light associated with the CARS process, (b) two-photon autofluorescence emission and (c) the SHG signal. A composite image of all three signals is shown in (d) and demonstrates how each co-registered signal can be combined to provide a comprehensive portrait of the sample. Figure 1. Multimodal nonlinear optical (NLO) imaging of a mouse kidney: (a) CARS, (b) two-photon autofluorescence and (c) second-harmonic generation. All three signals are displayed in a single, co-registered image in (d). The series of images of sections of mouse kidney has helped researchers understand the impact of fat content on cardiovascular disease and diabetic conditions in animal models. Images courtesy of professor Eric O. Potma, University of California, Irvine. The most common modalities used in multimodal NLO imaging are multiphoton fluorescence, SHG and THG, and CRS. Each provides unique and complementary benefits. Two- and three-photon fluorescence microscopy exploit the intrinsic two- and three-photon absorption-induced excitation of various organic dyes, fluorescent proteins and quantum dots that are typically used to label samples fluorescently. Long-wavelength ultrafast laser pulses have sufficient peak intensity to enable a high probability that two or three photons arrive at the molecule simultaneously, raising the fluorescent molecule into an excited state. The fluorophore then relaxes back to the ground state, producing fluorescence emission. Figure 2. Energy level diagrams that describe the nonlinear processes exploited in multimodal nonlinear optical imaging: (left to right) third-harmonic generation (THG), second-harmonic generation (SHG), two-photon (2P) and coherent anti-Stokes Raman scattering (CARS). In the THG process, three photons at wavelength λ are required to generate the THG signal at wavelength λ/3. In the SHG process, two input photons (λ) are required to generate the SHG signal (at λ/2). In two-photon fluorescence, an excitation source at wavelength λ with sufficient peak intensity is used, such that there is a high probability of absorbing two photons simultaneously, thus producing fluorescence at a wavelength just longer than the λ/2. The CARS process is a nonlinear four-wave mixing process that involves three input photons to generate the CARS signal at ωCARS = 2ωpump – ωStokes. THG occurs even in centrosymmetric structures and is useful for imaging interface heterogeneities as well as myelin sheaths in studies of the nervous system in animal models.5 Another benefit of both SHG and THG imaging is that, because neither process involves the coupling of electronic levels, photobleaching effects can be suppressed, enabling structures to be observed over extended periods. Chemically specific imaging also is possible and can be achieved by incorporating CRS into the same microscope platform. CRS microscopy comes in two unique forms: CARS and SRS.6 Both offer Raman imaging with a better signal-to-noise ratio and higher sensitivity than spontaneous Raman microscopy. CARS microscopy is the most commonly implemented of the two in multimodal NLO imaging, but SRS is rapidly growing in popularity. A typical multimodal NLO imaging system consists of a laser-scanning confocal microscope platform equipped with two ultrafast near-infrared laser sources; various interference filters for transmitting, reflecting and blocking light signals; and multiple high-sensitivity detectors to collect each of the independent light signals. One possible configuration for a multimodal NLO microscope for simultaneous two-photon fluorescence, SHG and CARS microscopy is shown in Figure 3. Figure 3. In this schematic of a multimodal nonlinear optical microscope, two ultrafast laser sources operating in the near-infrared are used to generate two-photon fluorescence emission, second-harmonic generation and coherent anti-Stokes Raman scattering signals within a sample. Dichroic filters are used to transmit and reflect the laser light into the microscope and to direct the desired signals to each detection channel. Each photomultiplier tube detector is matched with an appropriate emission filter to transmit the desired signal and block all out-of-band light. In this example, two-photon fluorescence and SHG imaging can be performed using a single widely tunable near-infrared femtosecond or picosecond laser. Introducing a second picosecond laser – commonly referred to as the Stokes beam (at the optical frequency ωStokes) – enables CARS microscopy. When this beam is spatially and temporally overlapped with the beam of the first laser – commonly referred to as the pump laser (at frequency ωpump) – the beams interact within the sample via a four-wave mixing process to generate the CARS signal at the new optical frequency ωCARS = 2ωpump – ωStokes. Both the Stokes and pump beams are collinearly overlapped and directed to a microscope head via a specially designed notch dichroic beamsplitter positioned at 45°. Through judicious wavelength selection, direct coupling of the characteristic vibrational modes that uniquely identify structures of interest within the sample can be achieved. In CARS imaging, the Stokes beam (ωStokes) is typically fixed at a wavelength of 1064 nm, while the pump beam (ωpump) is typically produced by an optical parametric oscillator (OPO), which can be tuned across the 700- to 900-nm-wavelength range. When the pump beam is tuned to a wavelength of approximately 816 nm, the frequency difference (ωCARS) is ~2850 cm—1, which corresponds to the symmetric CH2 stretching vibration in lipids. In this example, the same pump beam generated by the OPO laser at approximately 816 nm also can be used to generate the two-photon fluorescence and SHG signals within the sample. To avoid interference from the CARS signal, the Stokes beam can be blocked. Alternatively, to permit simultaneous multiphoton fluorescence and CARS imaging, the Stokes beam is allowed to pass to the microscope. Both the CARS and SHG signals are detected in the forward-scattering geometry, while the two-photon fluorescence emission is detected in the backward (epi) geometry. Just as important as the right laser sources is the choice of appropriate optical filters matched to sensitive detectors. For high-contrast multimodal NLO imaging, it is critical that the proper filters are used to transmit and reflect the input laser beams and to transmit the multiphoton and CARS signals. Characteristics that require careful consideration are: greater than 95 percent average transmission across the passband; steep edges; and high out-of-band blocking. Controlling and managing the level of undesired out-of-band light, such as the bleedthrough from the source lasers, is critical. Any stray laser light that reaches the detectors can significantly affect the acquisition of high-fidelity – i.e., high-signal-to-noise-ratio – images. Therefore, dichroic filters that transmit and reflect only the desired light signals as well as emission filters that provide high blocking (optical density >6 to 8) over an extended wavelength range are required. Examples of filter options for multimodal nonlinear imaging are shown in Figure 4. Figure 4. Examples of filter options for multimodal nonlinear imaging: dichroic/emission pair for multiphoton fluorescence, SHG and THG microscopy (left), and CARS microscopy (right). Photomultiplier tubes (PMTs) are the most common detectors used in multimodal NLO imaging. PMT detectors based on gallium arsenic phosphide are a suitable choice for detecting light across the visible range (400 to 700 nm). Alternatively, red-sensitive PMT detectors, based on multialkali metals – e.g., Sb, Na, K, Cs – that provide high sensitivity across the visible and extend out into the near-infrared (>900 nm) also are popular choices. Continued improvements in detector sensitivity, reduction in footprint and the advent of a less complex, easy-to-use modular design have all benefited NLO imaging applications. Optical microscopy continues to play an increasingly important role in biomedical research. To date, techniques such as wide-field, confocal and multiphoton microscopy have provided a wealth of insight and information on the form and function of a myriad of samples, such as live cells and biological tissue. By harnessing nonlinear imaging modalities into one unified platform, multimodal NLO imaging provides an even more powerful microscopy-based approach with which to study the health and function of biological specimens. One benefit of this approach in medical research has been the use of multimodal NLO imaging to advance our understanding of cardiovascular disease, a leading cause of illness and death globally. To elucidate the impact of diet, researchers at the University of California, Irvine, used multimodal NLO imaging to understand how dietary fat content affected kidney health in animal models. They varied the fat content in the diet fed to animal subjects over a period of weeks. Post-study analysis using CARS, two-photon and SHG imaging of the kidney allowed them to quantitate the levels of accumulated fat deposits within the kidney and their impact on surrounding structural components, such as collagen fibers. Multimodal NLO images from this study are shown in Figure 1. The researchers found a correlation among all three nonlinear co-registered signals, as shown by the composite image (d). CARS imaging clearly revealed the accumulation of lipid deposits within the kidney and was used as a quantitative measure for the fat content. They used the collected two-photon autofluorescence signal to locate and identify important structures – such as individual cells within the kidney tubules – and the SHG imaging not only to identify collagen content within the mouse kidney, but also to understand the impact of fat content on the level of collagen present as well as on collagen fibrillogenesis. Multimodal NLO imaging will continue to find widespread use and growing popularity in the life and health sciences. Continuing developments in ultrafast laser sources, specialized hard-coated optical interference filters and high-sensitivity detectors make it straightforward to combine various nonlinear imaging modalities, such as CARS, two-photon, SHG and even THG into a single, unified microscope platform. Dr. Neil Anderson is a technology development analyst with Semrock Inc., a unit of Idex Corp., in Rochester, N.Y.; e-mail: nanderson@idexcorp.com. The author thanks professor Eric O. Potma, University of California, Irvine, for supplying the data used in Figure 1. 1. W.R. Zipfel et al (2003). Nonlinear magic: multiphoton microscopy in the biosciences. Nat Biotech, Vol. 21, Issue 11, pp. 1369-1377. 2. C.L. Evans and X.S. Xie (July 2008). Coherent anti-Stokes Raman scattering microscopy: chemical imaging for biology and medicine. Annual Rev of Analyt Chem, Vol. 1, No. 1, pp. 883-909. 3. W.R. Zipfel et al (2003). Live tissue intrinsic emission microscopy using multiphoton excited native fluorescence and second-harmonic generation. PNAS, Vol. 100, No. 12, pp. 7075-7080. 4. C.P. Pfeffer et al (October 2008). Multimodal nonlinear optical imaging of collagen arrays. J Struct Biol, Vol. 164, Issue 1, pp. 140-145. 5. M.J. Farrar et al (2011). In vivo imaging of myelin in the vertebrate central nervous system using third harmonic generation microscopy. Biophys J, Vol. 100, Issue 8, pp. 1362-1371. 6. C.W. Freudiger et al (2008). Label-free biomedical imaging with high sensitivity by stimulated Raman scattering microscopy. Science, Vol. 322, pp. 1857-1861. A process whereby two fields of the same optical frequency interact in a nonlinear material to produce a third field, which has a frequency twice that of the two input fields.